Ongoing emissions reduction strategies are urgently required if we are to avoid runaway climate change. However, research shows that global warming and related impacts are likely to continue for centuries even if anthropogenic greenhouse gas emissions were to be reduced to zero today, due to the emissions we have already released (IPCC, 2014). As a result, we have to also plan for ways to respond to the impacts via climate change adaptation. To date, most strategies focus on one or the other of these two goals. However, if we continue to implement these two crucial pathways (mitigation and adaptation) separately, we run the risk of either increasing emissions or missing opportunities to reduce them via adaptation measures; we similarly risk building in vulnerability to climate change impacts in new renewable energy and energy efficiency measures. Using a low carbon resilience approach (LCR) that considers adaptation and mitigation strategies simultaneously offers opportunities to address these challenges holistically. LCR refers to climate change strategies that integrate and achieve co-benefits between greenhouse gas emissions reduction (mitigation) and planning designed to reduce vulnerability to climate change impacts (adaptation). This concept is gaining momentum at the international level through the Paris Agreement, the United Nations Sustainable Development Goals, the Sendai Framework for Disaster Risk Reduction, and the Intergovernmental Panel on Climate Change (IPCC). This paper* demonstrates the potential value of the integration of climate change mitigation and adaptation, explores examples of low carbon resilience strategies, and considers options for their implementation in Canada, where action on climate change is about to be accelerated by a federally mandated transition to a low carbon economy supported by national and provincial-level climate action plans. This paper is intended to stimulate discussion and innovation around the integration of mitigation and adaptation. *download the full paper from the right-hand column of this page. The text provided below provides an overview of the contents and key sections of the paper. Please see the full text for much more detail. From p.9 of the paper - Figure 1: Adaptation and Mitigation Model (Bizikova, Neale and Burton, 2008, p. 21). This model represents the connections between adaptation and mitigation (SAM), warning of the dangers of maladaptation. The vertical axis (A) represents adaptation, and the horizontal axis (M) represents mitigation. First, we outline the concept and value of low carbon resilience, along with its connections to key international and national climate change commitments. Low carbon resilience strategies are then discussed in terms of potential incorporation within mitigation strategies such as carbon pricing systems and renewable energy development, as part of the broader low carbon economy shift in Canada. For instance, carbon pricing can provide a budget to encourage innovative adaptation solutions that include the potential for both carbon capture and enhanced ecological health and resulting services. In the following sections we consider the capacity of low carbon resilience solutions to build on ecosystem services related to soil health, extreme heat, stormwater and flooding, as well as ecosystem health. The paper concludes by touching on the business case for low carbon resilience, including the economic value of ecosystem services, and the potential costs of inaction pertaining to vulnerable infrastructure. Below are the key points from the report. Please refer to the full paper (which you can download from the right-hand column) for much more detail, references and examples. Canada's national and provincial adaptation policies have so far failed to keep pace with the climate change impacts facing communities. Existing policies designed to respond to the threats of climate change are largely fragmented, both vertically between jurisdictions and horizontally amongst ministries and departments. This is partly the result of a separation between mitigation and adaptation processes. The implementation of low carbon resilience approaches has the potential to address multiple problems across sectors and jurisdictional boundaries, while reducing costs and maximizing benefits to both ecosystems and human society. 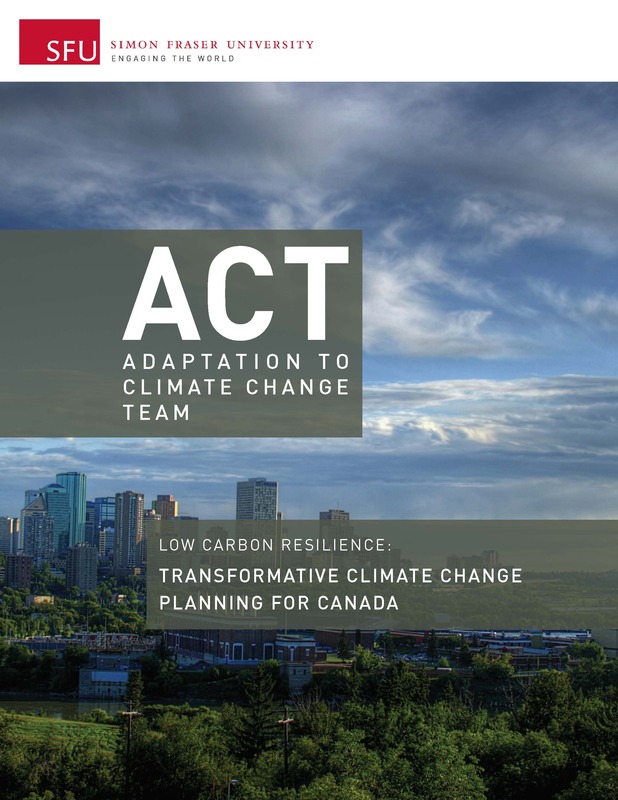 Many communities throughout Canada have already achieved aspects of low carbon resilience without explicitly referring to it as such (see the full paper for examples and brief case studies). Carbon pricing is an essential policy mechanism for driving minimization of greenhouse gas emissions and development of low-carbon economies. Many municipalities face significant infrastructure deficits and limited financial resources, as well as the requirement to both prepare for and recover from local climate change impacts. There is now an opportunity to utilize carbon pricing-related funds for low carbon resilience projects. For example, revenue from a carbon tax or cap and trade system might be re-invested into resilient infrastructure, and offset systems could be used to acquire lands for adaptation purposes (for an example see Case Study 1 on p. 16). The transition towards a low carbon economy requires careful climate change risk assessment if we are to avoid building in future vulnerability, and is required if Canada is to significantly reduce its emissions. Incorporating climate change resilience into the design and placement of new renewable energy systems and other infrastructure can avoid the need for costly refurbishments, relocations, or upgrades in the future. Low carbon resilience thinking can help develop agriculture practices that foster ecosystem health as well as adaptation and mitigation synergies. Government programs and funds that encourage climate smart agricultural practices and educate farmers on their use would help to bolster this movement. This can be achieved through ecosystem governance approaches and standards within relevant sectors. Low carbon resilience responses such as the restoration or introduction of urban ecosystems can help to cool cities, reduce energy demand and associated emissions, and improve air quality. For example, cooling the areas around air conditioning unit intakes through installing green infrastructure such as green roofs and gardens can help mitigate climate change through reduced energy demand, blackouts, and carbon emissions. Greening cities using trees can also provide carbon sinks and filter air pollutants. Green infrastructure can be used manage flooding and water stress in cities. Ecosystem-based solutions to stormwater management provide more permeability, which in turn reduces pressure on wastewater treatment systems and diminishes the threat of floods. These approaches, which include green roofs, bio-swales and rain gardens, can be incorporated into grey infrastructure and are less emissions-intensive than some traditional engineering approaches. Green infrastructure can also nurture biodiversity and link habitat corridors that are key to enhancing biodiveristy and protecting ecosystem resources. Protecting wildlife habitats that are fragmented by urbanization can help slow the rate of species extinction and significantly increase the carbon storage potential in forest and marine landscapes. In 2007, a report published by the Federation of Canadian Municipalities estimated that Canada faced a municipal infrastructure deficit of $123 billion that was growing by $2 billion per year. Significant amounts of infrastructure will need to be replaced in the next 15 years, and replacement costs are generally high. Incorporating green or blue-green infrastructure, or ecosystem-based approaches, as an alternative or complement to grey infrastructure can save money through implementation, replacement and maintenance costs; in general, ecosystem-based services tend to be more cost-efficient than hard infrastructure alternatives. The climate change crisis is finally invoking a global sense of urgency that is conducive to widespread innovation. Now is the time to develop climate leadership and promote coordinated adaptation and mitigation synergies that benefit ecosystems. With many practical examples to draw from, low carbon resilience solutions are emerging as some of the most strategic and effective tools that Canada can use to respond to the challenges posed by climate change. ACT (the Adaptation to Climate Change Team), based at Simon Fraser University’s School of Public Policy, is dedicated to developing and delivering a unique combination of research, outreach and policy innovation designed to benefit Canadian decision-makers, sectors and communities as they work to respond to the challenges posed by climate change. The authors gratefully acknowledge the support of the Real Estate Foundation of BC, which made this report possible.